As we walked around Oxford, we learned that we were visiting during exams. Students wore black robes (the length varying depending on their level of studies) with carnation boutonnieres. White means first exam, red means last, and pink is everything in between. 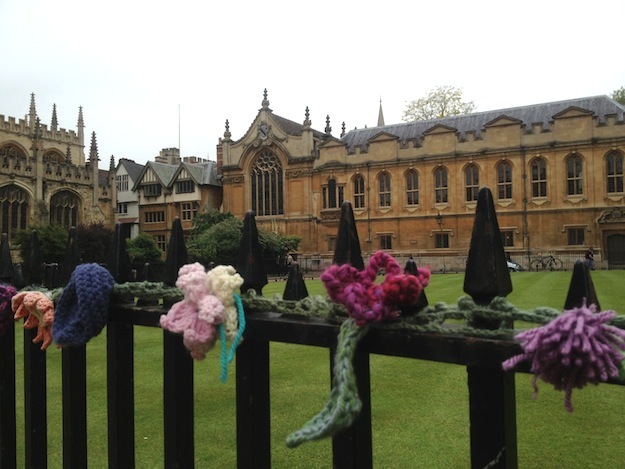 These knit flowers hung above the many bikes chained to the fence. Study break? Prayer beads? Jude, Great to hear from you. We are incredibly lucky to be doing what we are doing. We’ve been on the road for three years, longer than I expected, and still with lots of interest in seeing more. We love the opportunities we’ve had to stay in one place for a month or more (house-stting or renting). But as long as we take our time, we might keep on keeping on this way for a while more. We would liked to have seen you — and have fond memories of passing through Chester (or close to that right)? But we avoided the big cities of the Midlands and headed straight to the scenery around York and Hadrian’s Wall. Meanwhile, we’ve switched most of our travel blogging to http://www.TravelPast50.com. Keep in touch.